With new 2013 SUV models landing in showrooms around the country, such as here at your Montgomery area Honda dealer, inquiring minds will “ in this growing segment. 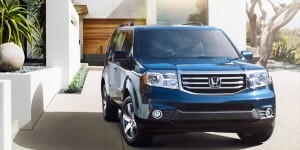 The versatility offered in an SUV has lead this popular segment of vehicles to carry a heavy list of contenders over the past several years, with the 2013 Honda Pilot continuing to raise the bar for the competition. Although rivals such as the 2013 Jeep Grand Cherokee might be adequate for some drivers, here at Middletown Honda we think families will find that the latest Honda Pilot was diligently crafted with their needs in mind. Knowing that today’s family is always on the go, the 2013 Honda Pilot offers a host of standard safety features designed with you in mind. Electronic brake distribution, rear parking assist with camera, and second and third row head restraints are featured in all trims. Speaking of the third row, the Pilot offers this bonus as a standard feature and it is not available in the Grand Cherokee, and while you are comfortably seated in that third row you can also enjoy standard rear heat and air conditioning controls. Honda pays meticulous attention not only to fuel economy and safety, but also to the comfort of your travels. Offering more overall headroom, more legroom and shoulder space for the passenger and driver, and shoulder room for the second row of passengers, the Pilot creates a more comfortable cabin experience than the Jeep. The passenger volume at 153.7 cubic feet over the Grand Cherokee’s 105.6 cubic feet lets you fill up the 2013 Pilot with the soccer team for ice cream after the game. Stop in today for a spin behind the wheel of the 2013 Pilot to see just why it stands out in the growing SUV competition! The friendly staff at your Montgomery area Honda dealer eagerly awaits the opportunity to serve you. Visit Orange County’s Middletown Honda, today!